Hey there, thanks for visiting! I’m guest designer with Dream Weaver this month and looking forward to sharing with you some ideas I have for using Dream Weaver products. The Dream Team is challenging its followers to be especially Thankful and Thoughtful during the month of November. Link your creations, using the Thankful and Thoughtful theme on the Dream It Up! blog using the Inlinkz tool at the end of my post – you could win the stencil of your choice and a bonus stencil of our choosing could be yours for using Dreamweaver products in your artwork. 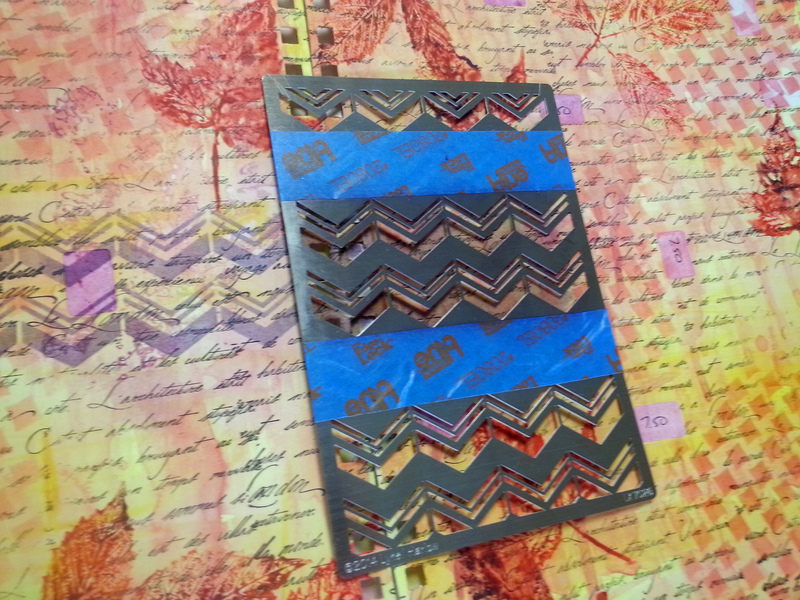 I couldn’t resist trying out the new Chevron Background Stencil LX7026 and the Pinwheel Checkerboard LX7013 in my Art Journal recently. I wanted to honor the beautiful colors of Autumn – a time to be thankful and a time for change. 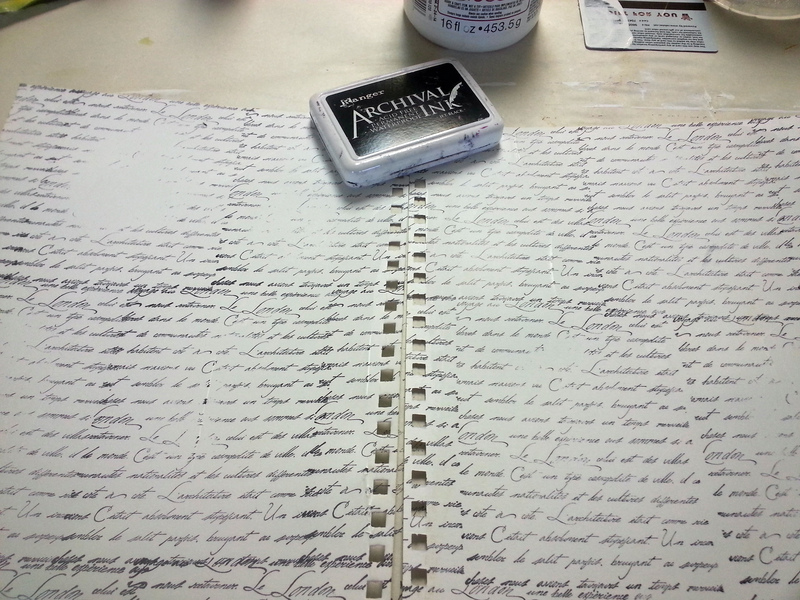 I started by stamping a script stamp over my entire background pages (140 lb mixed-media paper) with a waterproof ink, then heat set it. Then I painted a wash of yellow acrylic paint over the pages, heat set that and placed little re-positionable sticky labels randomly over the pages. These remain on until the very end so make sure to press them down firmly to prevent any leakage. Next I made washes of red, orange and purple and randomly slapped them across the pages at different intervals making sure to dry between each layer. 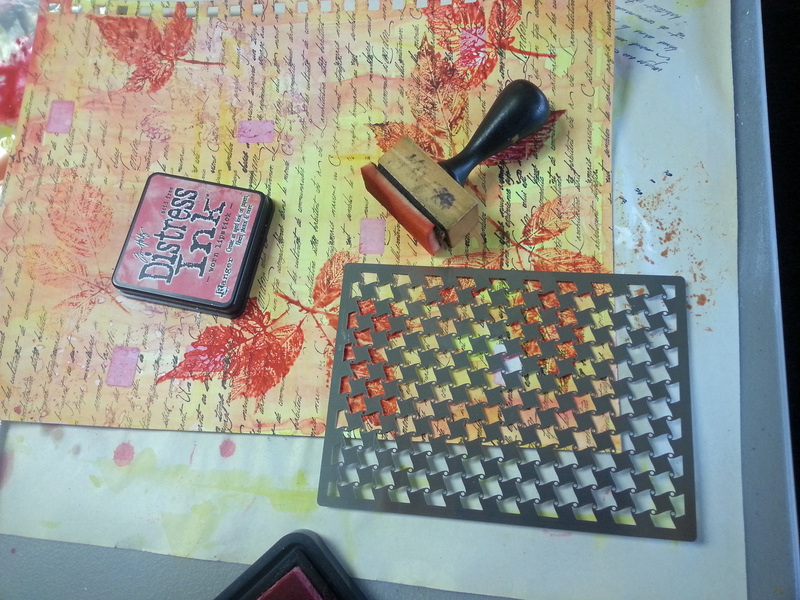 I used a mixture of acrylic paint colors and lightly brushed it onto my leaf stamps and stamped the pages. To bring more texture and dimension to some of the bare spots between the leaves I used Dream Weaver’s Pinwheel Checkerboard LX7013, Worn Lipstick Distress Ink with an ink applicator. I love the shape of the design. I love the shape of the design and look how it fills in the bare spaces and blends so nicely. 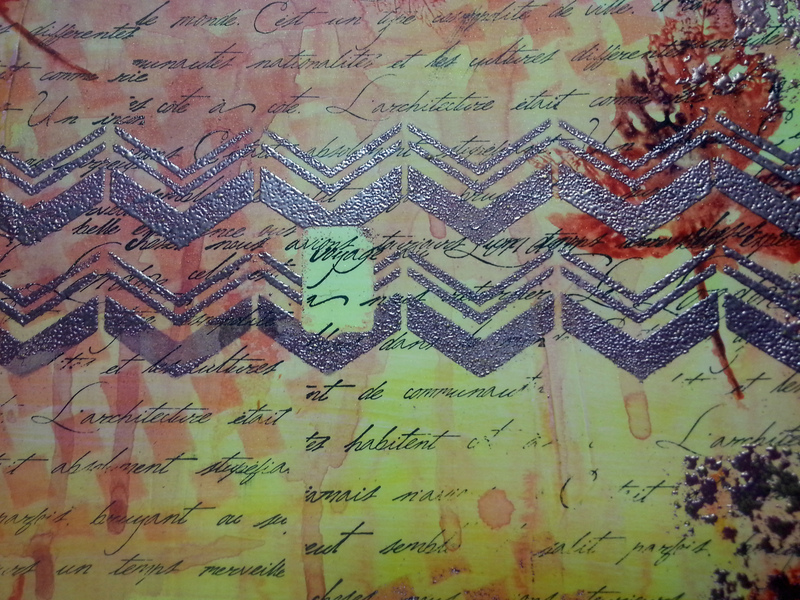 Once I got the background just so, I added a border strip across the two pages with the Dream Weaver Chevron Background Stencil LX7026, Dusty Concord Distress Ink and an applicator. I used painter’s tape to tape off the rows I didn’t want to use to prevent over-spill. I lightly dabbed some embossing ink around the page and sprinkled some copper-colored embossing powder on it. A happy accident – some of the powder dust spilled over onto the wet distress ink on the Chevron design. 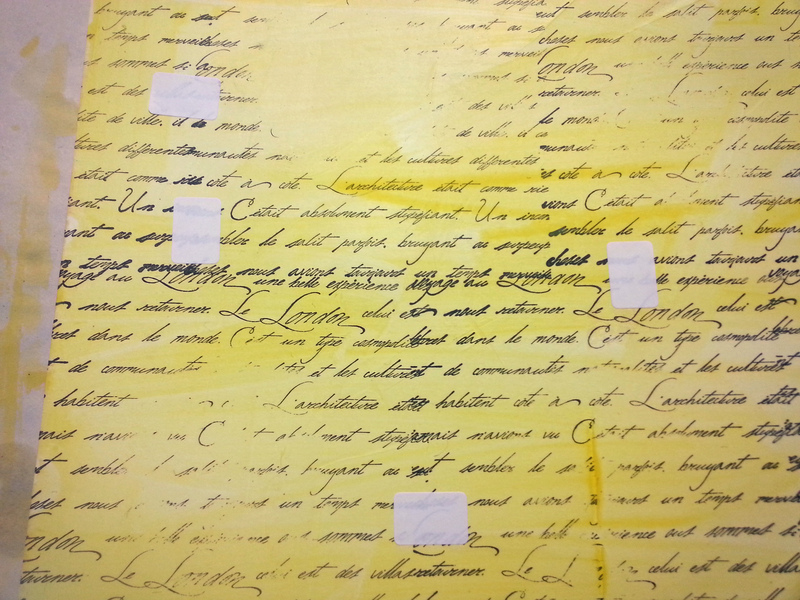 When all the layers are finished, the little re-positionable labels are removed to reveal some of the bright yellow below – every little step adds another layer of texture or dimension to the page. The journal pages turned out even better than I anticipated. Members of the Dream Team are very thankful when you leave a comment. I’m joining the “A” team lineup for this week – enjoy! I loved seeing the process of how you designed this page! Thanks! Thank you, Pam. I fell in love with that background design from that pinwheel stencil. Thank you! 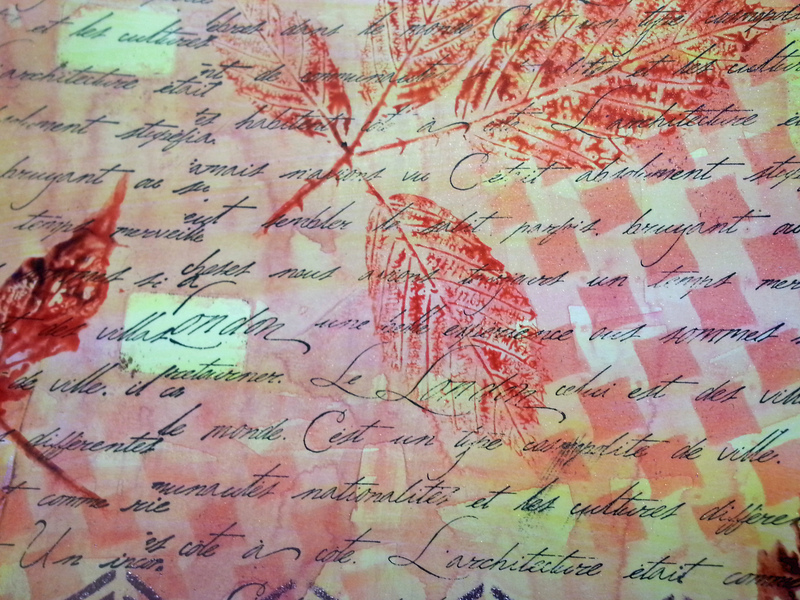 Love how easy it is to mask a stencil and add to a journal page! Beautiful, Linda. 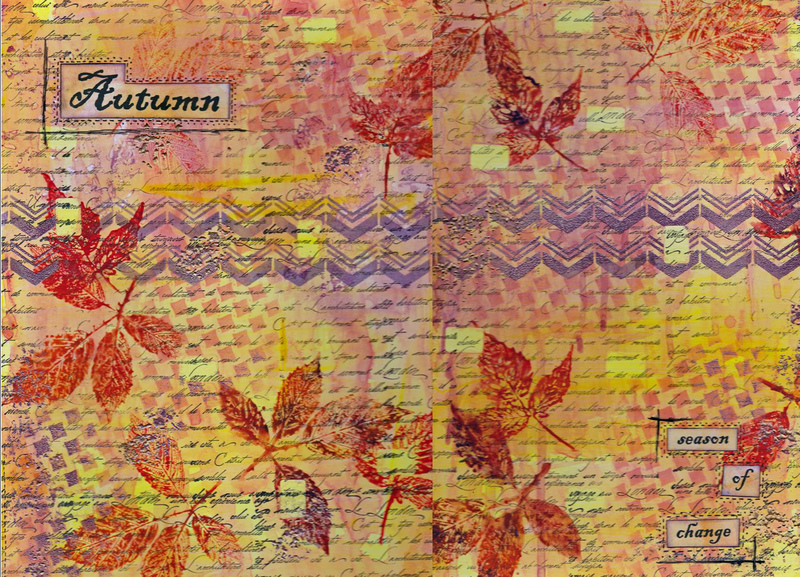 I am so glad I was able to learn how to do this art journal page from you. Thanks, Linda. Could be one of my favorites so far! Thanks, Robin. Gotta love those Autumn colors!